Thus read Stevey’s message to me at 9.20am on the morning of the Portrush Parkrun. He was on the bus that left Belfast an hour and a half earlier. I was staying closer to the north coast, and was to be the advance party. The problem was that a cold January morning became a winter wonderland somewhere around Ballymena. My plans to be there early were derailed by ice and a sloping driveway at my overnight lodgings near Ballycastle. Half an hour of skidding, pushing and, eventually, using front and back doormats to get free had left me behind schedule. So Stevey’s message arrived when I was also five minutes away, and equally concerned about making it on time. The increasingly icy roads meant putting the foot down to make up the miles was not an option. We were crawling against the clock. More than 30 BRC members were travelling to an event, and there was genuine concern that no-one would actually arrive in time to take part. When people say getting to the start of a Parkrun is an achievement in itself, this is probably what they are talking about. Both the bus and I pulled into the car park at 9.25am, with time to spare before the race began. Though after the drama getting there, the 5k run seemed like the easy bit. For anyone who has never ran it, Portrush Parkrun takes place entirely on sand, along the waterfront, at East Strand beach. Its exposed position on the north coast comes with both good and bad aspects. Ice is not normally an issue – during the December snow storms it was the only Parkrun in NI to go ahead. But runners are very much at the mercy of the elements. And the tides. High tide made for some last-minute course adjustments as the normal starting point was cut off by a foot of water. There was also a section where a narrow channel between sea and rocks left competitors judging the sea’s ebb and flow. There were three choices: wait for the water to recede and sprint through; climb over the rocks; or go route one and get wet. If you got it wrong the first time, there was another opportunity to revise your strategy on the way back. This was mentioned in the pre-race briefing, along with a warning against taking any risks. The race director eased the cold morning with a warm welcome for the sizeable BRC contingent. The out-and-back course meant every runner passed their BRC colleagues, so there was lots of waving and encouragement along the way. And encouragement was welcome as a freezing sea breeze, unstable sand and errant waves brought a unique Parkrun challenge. Alongside this there was the small matter of the BRC Race Series. Liz Robinson, who was taking part in her 100th Parkrun, was top of the table on the day and took maximum points, with Jill Mellon and Monica Gallagher second and third. Mark Harvey (the first BRC member to cross the line in Portrush), Brendan Mulgrew and Fabrice Scoupe made up the top six. Overall on the BRC Race Series Mark Harvey leads ahead of Monica Gallagher and John Nelson. It’s still early days after three events, with plenty of racing left, but well done to the leaders. However, the competitive element took a back seat to the camaraderie on a challenging course. 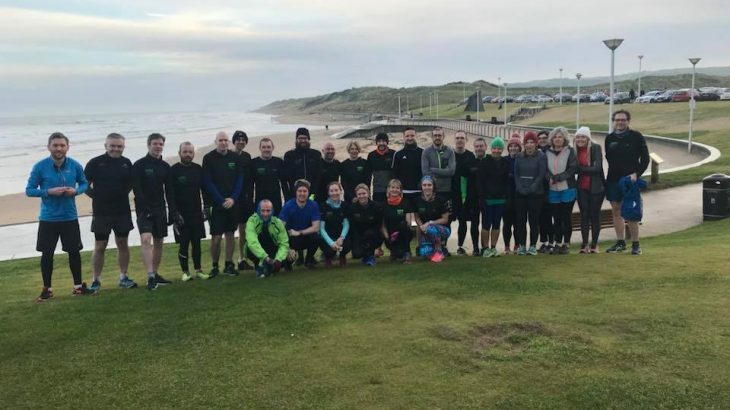 It was the first time at Portrush Parkrun for many members, and the regulars have extended an invitation to come back in more favourable weather. No-one in the club took up the invitation from the Arcadia Bathing Club to go for a dip in the sea afterwards, though several brave members did wade knee deep into the waves. By the end of it, the shared experience of sandy trainers, wet feet and the ocean breeze started the year on a high for Belfast Running Club. Thanks to all the BRC members who took part and, in particular, those involved in organising, including Stevey compiling the points and JP organising the bus. Next up, we’ll be swapping surf, sea and sand for mud at the Stormont Cross Country on February 3 for the fourth event in the Race Series. Because running on flat tarmac in pleasant weather would just be boring.